Belgium opened their Euro 2020 qualifying campaign with a 3-1 win over Russia despite a huge mistake from Thibaut Courtois. Quarter-finalists in France four years ago and semi-finalists at the 2018 World Cup, Belgium took the lead after 14 minutes through Youri Tielemans' powerful, low finish. However, Courtois gifted Denis Cheryshev an equaliser soon after, with his blushes spared as former Chelsea team-mate Eden Hazard's penalty on the stroke of half-time restored their advantage. 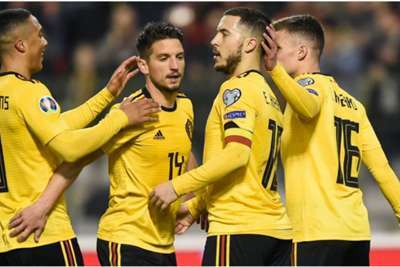 Hazard doubled his tally in the 88th minute to settle the Group I contest in Belgium's favour before Aleksandr Golovin was sent off for a second yellow card. The counter-attacking football that was a distinct feature of Belgium's World Cup campaign proved key in opening the scoring as Michy Batshuayi crossed from the left for Timothy Castagne, who laid off for Tielemans to rifle into the bottom-left corner. However, just under two minutes later Russia levelled in bizarre fashion as Courtois' disappointing season continued. The Real Madrid goalkeeper received Jan Vertonghen's backpass under no pressure but took too many touches and, being closed down by Artem Dzyuba, played the ball straight to Cheryshev, the Valencia winger making no mistake in skipping over Courtois and converting from a tight angle. Batshuayi saw an effort cleared off the line as Belgium sought to restore their advantage, which Hazard did with a confident finish from the penalty spot after he was clumsily brought down by Yuri Zhirkov. The left-hand post denied Batshuayi a deserved goal 12 minutes from time but he was involved as Hazard made it 3-1, teeing up his team-mate to fire in following Dries Mertens' right-wing cross. Golovin's dismissal came two minutes later, as he ended a poor night with a second yellow after kicking out at Mertens. The scoreline could have been even more comfortable had Belgium enjoyed a touch more fortune. They were not at their best but, against a Russia side that looked a far cry from the team that reached the quarter-finals of the World Cup last year, they did not need to be. It looked as if Russia may provide Belgium with a difficult evening after Courtois' mistake. The visitors were poised to go in to half-time level but Hazard had other plans, winning a penalty with a turn in the box that drew a panicky Zhirkov challenge and converting it with consummate ease. His finish for the third was just as assured and put the game beyond any doubt. Dropped for Zinedine Zidane's return to the Madrid dugout last weekend, Courtois did not inspire confidence with his 16th-minute howler. For a keeper considered one of the best in the world, this was a startling loss of composure. Belgium face Cyprus in Nicosia on Sunday, while Russia travel to face a Kazakhstan side buoyed by their surprise 3-0 win over Scotland.